Congrats Changemaker! You did it -- you’ve made real change. Now it’s time to let all the people who helped you get there know how you won. Declare victory on your petition only after a concrete change has been made. Sometimes, the final solution looks a bit different than what you originally asked for, and that’s ok. If you feel like it’s a win, declare victory. If there’s something else you want to ask for, you can always start another petition. We’ve created a tool to help you share your victory with your supporters. 2. 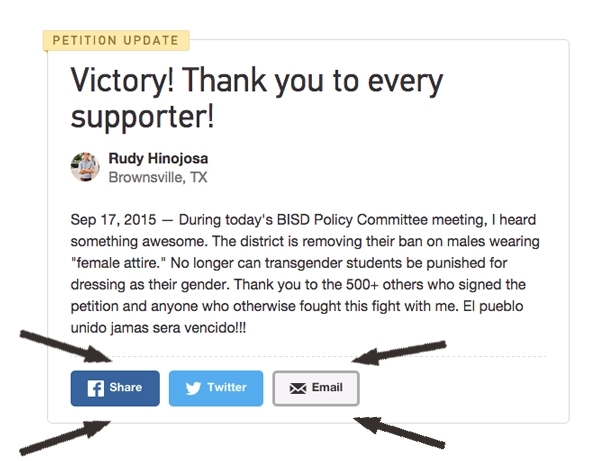 Scroll to the bottom of your petition dashboard and click "Declare Victory"
3. Thank your supporters in your victory post, and let them know how much you appreciate their help. We’ll send an email to your signers with your post telling them about your victory. The post will also be featured on your petition page. After you’ve told your supporters the good news, there are a few final steps to your petition. Send a thank you email or *gasp* a handwritten note to your decision maker and let them know what the change means to you and your supporters. This is a good opportunity to show that you and your supporters are committed to your cause and the change you negotiated for. Was your petition featured in the media? Be sure to reach out to the journalists that wrote about it and let them know of your victory! Tell them how you got there and thank them if they supported it. Encourage your friends and family to start their own petition on an issue they care about. Haven’t seen any concrete change yet? Check out these tips to build more momentum for your petition.